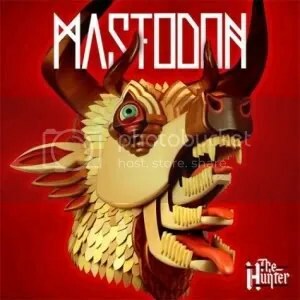 The time leading up to the release of Mastodon‘s Blood Mountain album I found myself rather surprised that all of a sudden they were getting large amounts of promotion and press in big name magazines and sites leading up to the albums release. I had become familiar with them through the mind-blowing album Leviathan(which includes, IMO, one of the all time best metal songs ever, “Blood and Thunder”). While Leviathan wasn’t the most “extreme” album in the world, I would consider it an album “extreme” enough to keep Mastodon in the metal underground and seeing all this popular press about them seemed odd. When Blood Mountain finally came out and I got my hands on it I understood why they were getting so much positive press. First off it was a top-notch metal album and it also held a bit of change in style for the band where they were able to take a sludgy, proggy, heavy, and epic-y(?) sound and successfully make it accessible to more straight forward metal fans(and non-metal fans) without compromising their integrity nor deflating their core sound and audience, a feat that is very difficult to pull off. They followed up Blood Mountain with Crack the Skye and did so successfully with an even more proggy sound this time around. Now we now have the follow-up to Crack the Skye which comes in the form of The Hunter and instead of following the super proggy concept album path they have been heading down for some time now Mastodon takes a slight detour and goes back to some roots heard on earlier albums such as Remission and still manages to maintain a good amount of their newer prog elements and their accessibility. I’m sure you’ve all heard the expression “Don’t judge a book by its cover.” Most of the time that’s easier said than done. I’ve purchased a decent share of albums based on the cover alone, some covers gave a good representation of what may be on the album, some misrepresented and I’ve been led to my share of “meh” albums. When you have an album with great artwork along with some great music contained within you have yourself a special package that pleased many of your multiple senses. And as an avid CD collector the album artwork is something special to me. Since many of you are already familiar with many of the classic album covers such as Master of Puppets, Seventh Son of a Seventh Son, and Sabbath Bloody Sabbath I’ll make a list(in no particular order) of more modern album covers from 2000 and onward from popular and lesser known bands(one per band). What are your favorite album covers and how important is the artwork in an album to you? Enjoy!!! Peace Love and Metal!!! Bands I Should Like, But Do Not! So don’t throw a hammer at me or anything because of this list. I think of myself as an equal opportunity metal fan, but there are some bands out there that I have heard numerous times and/or seen in concert and I still can’t get into them. So if you asked me if i liked any of the five bands I am about to list, I would either say no or shrug my shoulders in uncertainty. This list is in no particular order. 1. Lamb of God. There is no underestimating this band’s popularity. I want to really like them, I really do because they are a no frills metal band. They kind of remind me a bit of Pantera. I even saw them three times in concert with Anthrax, Slayer, and at Download 2010. I also own two of their albums and still…just can’t be crazy about Lamb of God. This is one of the shrug my shoulders bands. I think I am missing something here. 2. Mastodon. This is another one I just do not get. I saw them once with Slayer, but do not own any material from them. I feel I should like them, but again, not sure what I am missing with this band. When I saw them, they were loud and heavy live, but I sat in the bleachers patiently waiting for Slayer to come on stage. 3. Avenged Sevenfold. I have seen probably all of their videos on Scuzz and Kerrang. I can see that this band has some talent individually, but as a group I think they are missing the mark. I heard that their earlier stuff was more heavy than it is now. They seem so popular today, but more with the younger metal crowd. Maybe it’s because I am pushing 40 that I do not get this band. 4. Coheed and Cambria. I like when bands come out with a different style of music. I like some prog bands and I think this is where Coheed and Cambria fit…so why is it that I can’t get into them? I am not sure why. I see that they are wildly popular with their fans and that they are highly talented, but when I hear them I find myself scratching my head. 5. Meshuggah. No way. I tried, I really did, and this is one band I feel I should like, but no. I bought an album, gave it the three customary listens (for proper judgement), and no. This band is a no-go for me. I could probably name a few other bands, but I went with a list of bands that I know reached a certain level of popularity and/or success in the metal world. I should like them, but either I am still uncertain or I just do not like them. Do you think I am missing the mark here? What are some bands you feel you should like, but do not? Chime in, let’s talk about it.